“Free the land!” is the rallying cry of the Malcolm X Grassroots Movement (MXGM). The struggle for control over land—whether by maroon communities escaping enslavement, families and sometimes whole communities seeking independence from the plantation after the Civil War, or small farmers today fighting economic ruin and displacement–has always been a central component of the Black Freedom Struggle. Much less well known is the important role of cooperative enterprise in this same struggle for land and self-determination. As Jessica Gordon Nembhard’s Collective Courage documents, worker co-operatives and other forms of cooperative enterprise have been present in every phase of Black history in America, fostering economic independence and communal solidarity while influencing important movement leaders including W.E.B. DuBois, Ella Baker, and many others. Today cooperative enterprise and communal solidarity are at the heart of an emerging movement in Jackson, Mississippi led by MXGM. Voices of Jackson Rising: organizers speak about local efforts. The population of Jackson, like much of the southern Black Belt, suffers from poverty and marked capitalist underdevelopment. Jackson is shockingly hollowed out as a city. Among the first indications of the infrastructure crisis that one sees when entering the city are the fire hydrants that are left open periodically to flush the water system of “iron and other sediments.” The infrastructure (roads, water treatment, waste disposal, the buildings themselves) are at a level of dysfunction that can really only be compared to Detroit among contemporary U.S. cities. There is practically nothing open in the whole downtown area except government buildings, and there seems to be no area in the city that has been spared the same fate. Mississippi is the heart of Deep South white supremacy; throughout U.S. history, radical changes in the political and economic climate of Mississippi reverberate powerfully throughout the region and the entire U.S. Whether one considers the consolidation of the most radical wing of the slaveholding plantocracy in the push for Confederate secession, the development of sharecropping as a means of subordinating Blacks to the plantation system after the Civil War, or recent political trends of white vigilante violence and union-busting legislation, Mississippi and the South as a whole have been in the eye of the storm. However, Mississippi holds an equally central place in the history of the struggle for Black self-determination, from the Union League movement during Reconstruction to Freedom Summer and the Lowndes County Freedom Organization (later the Black Panther Party). 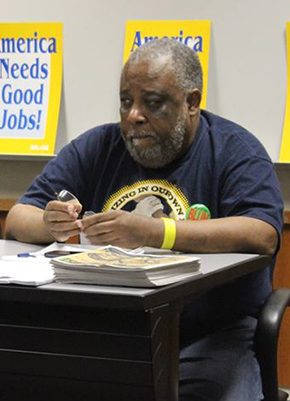 This past weekend, May 2-4, some 400 individuals gathered in Jackson to discuss and support a movement to build a solidarity economy in Jackson based on democratically operated worker co-ops. What is a co-op? What does it take to start one? What will it take to build a solidarity economy in Jackson and throughout Mississippi, driven not by profit but instead by human need? What can we learn from cooperative movements in Venezuela, South Africa, and Zimbabwe? These were among the questions eagerly discussed at the Jackson Rising: New Economies Conference, an historic gathering of social movement leaders, co-op worker/owners, co-op federations, Left organizations, and other individuals coming together around a common vision of co-operative development. The opening plenary at the Jackson Rising: New Economies conference. 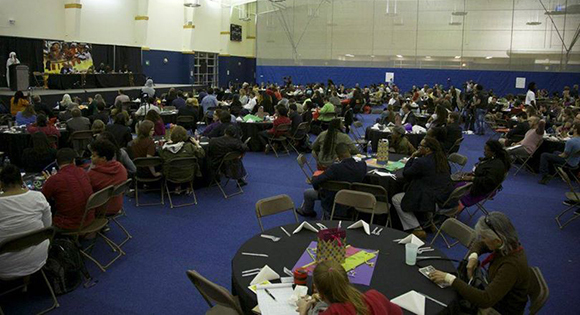 Around 400 people attended the event. While the movement to form worker co-ops in Jackson is just beginning, the initiative is building on decades of organizing in Jackson by MXGM and their allies. While the tragic passing of Mayor Chokwe Lumumba shortly into his first term leaves the cooperative movement in a harsher political context, other MXGM-initiated projects may provide the support needed to begin implementing their vision for cooperative development. Among the most important part of Lumumba’s campaign and his time in office was his commitment to following the lead of the Jackson People’s Assembly. In their Jackson Plan: a Struggle for Self-Determination, Participatory Democracy and Economic Justice, MXGM describes the People’s Assemblies as “vehicles of Black self-determination and autonomous political authority of the oppressed peoples’ and communities in Jackson.” They operate on the principles of participatory or direct democracy “wherein there is guided facilitation and agenda setting provided by the committees that compose the People’s Task Force, but no preordained hierarchy.” The Jackson People’s Assembly was instrumental in electing Chokwe Lumumba to office but strictly maintained their political independence from the administration. In the community of West Jackson, residents have already begun building a model of MXGM’s vision for cooperative and community development. Among the first major initiatives of the Cooperative Community of New West Jackson (CCNWJ) was the founding of a one and a half acre community farm, a cooperative housing network, and a community center—the Malcolm X Center for Self-Determination. While projects for small-scale community self-sufficiency can languish if they remain isolated from political struggles and broader movements for structural transformation of society, CCNWJ is building durable community infrastructure for MXGM’s political base in Jackson while combatting fatalism and despair. These projects are impressive, and the Jackson Plan as a whole laudably ambitious, but it must be acknowledged that the loss of power in city government has been a tremendous setback. Many of the projects in Jackson relied in a strategy of dual power—grassroots power through the People’s Assemblies and other forms of working class self-organization, state power through the Mayor’s office and the rest of the coalition assembled by Chokwe Lumumba—and half of this equation is now missing. Forces in the Jackson Chamber of Commerce, in the state Democratic Party, and even among capital which were conditional allies of the Lumumba administration are now siding more firmly with a neoliberal agenda in opposition to all aspects of the Jackson project. Chokwe’s son, Chokwe Antar, made an impressive effort on short notice in the special election for a new mayor, winning 46% of the vote with only 4-6 weeks to campaign and no prior name recognition as a candidate aside from association with his father. Chokwe Antar won 68% of the Black vote, but only 10% of white voters, and the much higher voter turnout among white voters arguably made the difference. As MXGM members made clear, most poor and working class Black people in the city understand the problems with the system, they just don’t see electoral politics as a real avenue for change or for meeting their immediate needs. All of this suggests a need for reflection and re-evaluation, but this is certainly not time to abandon the project or cease support for it. Organizers in Jackson need support now more than ever. Their project is unique and impressive, and represents an opportunity not just for building toward Black and working-class power in Jackson, but for the whole U.S. left to learn important lessons about how to wage these struggles nationally. We encourage everyone to learn more about what’s happening in Jackson, and to consider supporting the project financially and/or by visiting the city and volunteering your time and energy. Jackson Rising: An Electoral Battle Unleashes a Merger of Black Power, the Solidarity Economy and Wider Democracy.